Audubon Society of Central Arkansas - Page 3 of 122 - The mission of the Audubon Society of Central Arkansas is to encourage programs and activities supporting all things natural, wild, and free, especially birds, bird habitat stability and improvement, as well as to promote fellowship among members, educate and inspire the public, and champion the highest standards of ethical outdoor conduct. From November 15 to December 7, 2018, Joe and his wife took a nine day trip to Antarctica, followed by three days in Santiago, Chile, and 3 days on Easter Island (Rapa Nui). It was a trip he had been planning for three years to fulfill a lifetime ambition. They saw amazing wildlife – Leopard Seals, Crab-eater Seals, Weddell Seals, Orcas, Minke Whales, Fin Whales, and Humpback Whales. Joe added 30 birds to his life list. Come and share in his experience through his many wonderful photos. Joe Tucker grew up in Tennessee where his family helped him develop a love of photography and travel at an early age. Before moving to Arkansas in 1995, he also lived in South Carolina, Georgia, Oklahoma, Alaska and Texas. Joe earned college degrees in Chemistry and Education while honing his photographic skills in the hills, caves and mountains of Tennessee. After attending the New York City School of Modern Photography in the 70s he taught photography classes at public schools and scouting programs. After retiring from a 35-year career in commercial casualty risk, claim and litigation management he is now exploring more of our planet. He has traveled to every US state and Canadian province, the Caribbean, Central America, South America, Europe, Asia, and Africa. He and Linda, his wife of 49 years, recently returned from Antarctica, rounding out their visits to all seven Continents. Next year he hopes to visit South Africa to round out his Southern Hemisphere bird collection. Joe is a certified Arkansas Master Naturalist, and volunteers with Raptor Rehab of Central Arkansas, Arkansas Game and Fish, Hospice and the Red Cross. He now concentrates his photography on birds. It was frigid Saturday morning for ASCA’s Feb.16 field trip, which was held the weekend of the 2019 Great Backyard Bird Count. We started at the bridge at the east end of Two Rivers Park. For the first part of the morning, the land birds wanted nothing to do with us. Pishing, playback; no birds moved or responded in the cold. Try pishing with frozen lips in 28 degree weather-it is tough! 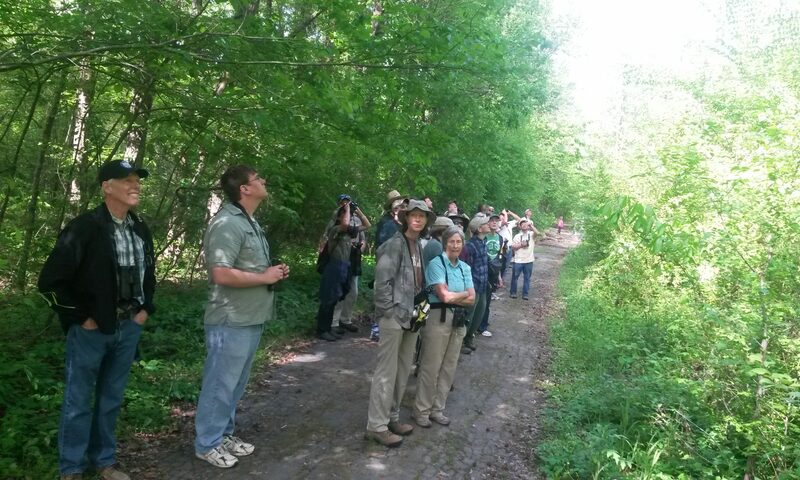 But our fifteen birders persevered, slowly walking the trail. A juvenile Bald Eagle glided by overhead; an adult sat quietly in a tree watching us. The water birds were scattered around the river inlet, mostly in large groups of Gadwalls, Scaup, and Cormorants. The 100+ group of Ring-billed Gulls stayed close together on a sandbar, with another large group spiraling overhead. Nine American White Pelicans huddled together sleeping soundly. A much larger group of Pelicans glided in then circled overhead. We flushed two female Goldeneys who flew over to hang out with the Canada Geese. Circling back to the bridge, we played the Carolina Chickadee alarm call which finally stirred up the birds. Chickadees, Kinglets, Hermit Thrushes, and two Red-breasted Nuthatches responded enthusiastically. Walking to the end of the park’s peninsula, we located four Fox Sparrows, several Field Sparrows, Cardinals, Savannah Sparrows, and lots of Juncos foraging under the trees, including a couple of Yellow-rumpled Warblers. The group then drove to the west end of Two Rivers Park. The morning was finally warming up and birds began to stir. At the “swamp”, we called up three very vocal Winter Wrens, all chiding us at the same time. The group then headed to the big, open field where the group spread out to walk in a long line, hoping to flush sparrows. It took a third pass through the field to finally flush our target bird, the LeConte’s Sparrow. We flushed at least four. Two cooperated beautifully by teeing up in one of the small bushes, then sitting side by side for several minutes. Cameras were being fired at lightning speed getting lots of great shots of the posing birds. Very pleased with our morning and the 47 bird species we saw, we headed back to our vehicles, then home thaw out. Critters seen were deer, cottontails, and an opossum.